It's hard to imagine life for a woman during this time of colonization. I can visualize the settlers in Virginia, building log cabins, settling in the rich forested areas in what is now West Virginia. This was the stuff I was taught through history books, and television shows like Davey Crockett and Daniel Boone. Many of these settlers, several generations removed from their colony parents, had already entrenched themselves into the rough life of survival. Living there was a testament to the family's boldness. "Anky" - Agnes, had several older brothers, lovingly called "the Hensley tribe". The family along with my Godsey ancestors worked shoulder to shoulder in creating their community a few miles south of Cumberland Gap, on the Tennessee River. This was a time of turmoil with the royal order and the British oppression Surrounded by thick woods, it was also the home of Native Americans who became increasingly hostile because of encroachment on their lands (rightfully so). The further out the settlers moved to get away from the British thumb , the more resentment the natives had on this encroachment. Beyond that, their move was illegal, as the colonists were defying a royal order that reserved land west of the Appalachian Mountains for natives. The threat of attack increased as the American Revolution began back East: the tribes who lived beyond the Appalachians understandably wanted the British to put down the rebellion, and almost all of them allied themselves with the British. While living with the daily reality of a terrifying attack, the pioneer women were busy with having (and raising babies), cooking, washing, sewing, weaving, and other household tasks without the supplies that most housewives could take for granted. While men hunted and fished for food, frontier women grew vegetables, tended to livestock and poultry, and often did other farm work. Thomas Godsey, Jr., with his wife, Nancy, and four youngsters, settled a few miles south of Cumberland Gap, on the Tennessee River in 1765. He, his wife, and the two oldest children, Elizabeth and Blackburn, along with six other settlers, were massacred by Indians in 1769. They were all buried in one grave near Maynardville, which is now flooded by Norris lake. The two youngest sons, William and Austin were spared, and returned to Buckingham County, Virginia. Six young men -- teenagers -- were lying prone on a knoll, about 50 yards away, and down wind from where a small band of Indians were camped. Their relative positions gave the boys a 360 degree view. They carried no firearms, but were formidably armed with knives and hatchets. The youths, had been lying in their positions for 14 hours, disregarding flies and mosquitoes. At dawn, a group of 10 armed braves departed from the camp below--silent as shadows. Several minutes later, from the river, came the vacant hysterical laugh of a loon, given at various intervals. The sequence time was carefully noted by one of the boys, the leader. It was a signal to hit hard, fast, and then get away. They had about five minutes to achieve a very exacting chore--there were no second chances. The six youths acted swiftly with precision. Silently, and as vicious as hungry jungle cats, they moved through the camp, striking and slashing. In less than five minutes, it was over. All were dead -- old men, women and children -- except for a ten year old white girl who was gagged and carried away--she soon understood why. The young men and the girl ran for nearly 24 hours without stopping before reaching the settlement. It was then they knew their mission was a complete success. William and Austin Godsey and five Hensley brothers had rescued Agnes (Ankey) Hensley. In doing so, it was necessary to avenge the massacre of their parents, who died on that very spot five years before. Just the will to survive, after you have been kidnapped from your family, and the courage of a very young girl during these times makes Davey Crockett and Daniel Boone common people in my eyes. To live with a tribe from the age of 6 until 11 years of age, lends words and thoughts in my mind how this young girl survived the odds of the wilderness and perhaps the cruelty of the natives. This was Agnes Hensley Godsey, and she is my 4th Great Grandmother. At the age of 16 she later married one of the Godsey boys that saved her and they prospered and had eleven children. 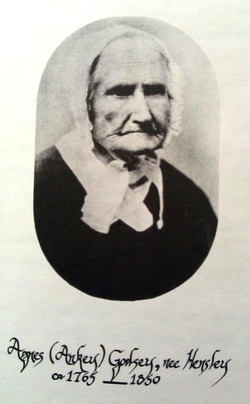 She lived until 1850 (we think that would be correct)...but this picture of her was in my Uncle's book. To live to the ripe age of 85 is miraculous in itself. The camera and the taking of still pictures was still fresh in our world. If it had not been for my Uncle's persistence of finding who our ancestors were, I wouldn't have this fascinating story to write. Not only was the woman a frontier woman, she lived long enough to see our country go through a revolution, and then become fracture deeply with it's divisive platforms on slavery, culminating into the Civil War. I hope I do her justice.